We are Wadaiko Tawamure vzw, the taiko group of Brussels. Taiko is a unique form of Japanese percussion that energizes both body and mind in compelling rythmes. 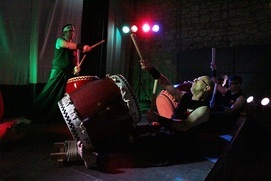 You can best describe Taiko as a crossing between sports, music and Eastern martial arts. It's not agressive or heavy, but dynamic and fun. A performance by a Japanese Taiko-group captivates its audiences like nothing else. It's one big show that amazes both young and old. Wadaiko Tawamure offers various workshops (including beginners / children and business (teambuilding)). We're also available for performances and demonstrations. We offer beginner courses for those who are interested in playing taiko themselves. These courses consists of 5 workshops. During these courses we"ll teach you how you have to stand properly, how to hold your bachi (sticks which you use on the drums) and we'll teach you some rythmes. When there is enough interest we'll organize a follow-up course of another 5 workshops. These workshops always take place in Dilbeek. Contact us for more information or to be notified when a new course starts. Are you interested in a different kind of team-building activity? Do you want to amaze your guests with a performance of taiko? We offer a variation of possibilities and will always try to adapt to your needs. Send an e-mail with as much details as possible and we'll let you know what we can do for you.